How to use the abundant energy to your advantage and change your negative states into positive states and reach your goals of weight loss, toned body and success? How to read a label like a pro and lose weight? What do the gut and the brain have in common? Why is the gut called the second brain? What is brain fog and how can you get rid of it? High energy workshop to deeply understand nutrition, wellness, weight loss and keep it off for life. Please wear comfortable shoes at the event. Food and refreshments will be provided. 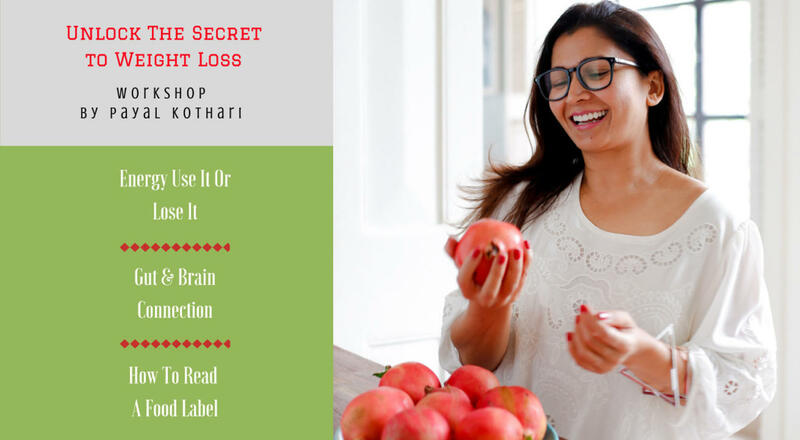 Payal Kothari, is an integrative & functional nutritionist; she has studied from the world's largest nutrition school IIN, New York, USA. She believes that all fad diets fail, but transformations last forever. Weight loss is a side effect if all your primary & secondary foods are in place. Under her, a family of 4 has lost 91 kgs in 6 months (Mumbai Mirror, 1st. September 2018) and many more have achieved their goals and sustained them for ever.